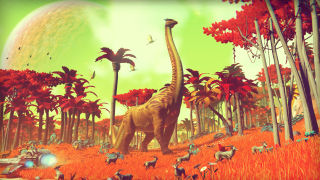 Looking forward to taking in the infinite space of No Man's Sky? Well, you might have to wait a little bit longer to jump in your ship. As reported by Kotaku, a reliable source has informed it of a delay that might now mean a July or August release date. It's also been sent much more concrete evidence in the shape of marketing materials. A Gamestop employee has revealed that the below posters arrived in store with the original June 21 release date but the chain has been informed that this is no longer correct. They have been instructed to cover the initial release date with a 'Coming soon' label. Given the vast swathes of infinite space on offer, it's not really a surprise to have a delay here. Even that extra couple of weeks was clearly necessary for Uncharted 4 to be just right. Hopefully this does only mean a couple of months. We'll keep you updated.